But at a fundamental level relating to fairness for all workers unions need to get on the same page. Being a right wing or left wing union means that those unions are focused on issues not related to the lives of workers but to deals, connections and influence that are focused on personal power. The worker loses out when unions fight with each other and cause disunity within the Labor Party. If they can put their differences after their commitment to workers, and show this to Australians at large, support for them may return and we may get a more cohesive Labor Party that can attract majority support from the electorate and properly responsible tribunals. Unions or their leadership, like Labor, have to an extent mirrored the LNP and corporate elites ie. predominantly pale and male and/or skip. Hence sectors that have become more diverse in employees both local and temporary or part time, with significant ‘foreigners’ or dominated by small business, have been Drneglected; outside of traditional blue collar sectors of manufacturing and resources especially, and including white collar such as the public sector including health care. While the traditional demographics of elites are declining (or now retired and more conservative) seem to be exerting more influence or being influenced including the public service which has been hollowed out ie. casuals employed from hire agencies at lower levels with no or limited tenure, and much outsourcing; this includes the health sector. Another issue is not tracking new and increasing employment in growing services sector again health, plus finance, IT, education, tourism & hospitality etc. While having sub-optimal coverage in supporting local employees in these industries, those sectors where many internationals are employed or are the customers, are dog whistled and/or ignored eg. international education (dominated by Oz employees on sessional or temporary contracts), ditto health care with outsourcing, then those who employ students and backpackers including tourism & hospitality, agriculture, retail etc. Understand retail union has always been quite right wing, but the CMFEU appeared to be targeted some years ago by ‘Australia’s best demographer’ to help misrepresent international students in media and public narratives (taking our jerbs) who were constantly dog whistled by being described as ‘immigrants’ suggesting permanence when in fact only temporary residents with part time work rights (only a small minority eligible for permanent residency); net financial contributors and supporting education and related employment (nowadays immigration and population data is routinely misinterpreted and misrepresented in media and social narratives, due to the UN definition change in 2006 to purposely inflate headline numbers). However, while a thousand jobs were lost at Port Kembla (?) ten years ago and Ozzie blue collar workers highlighted constantly by media and related unions, there was silence when 20k non unionised Oz workers lost their jobs in education and related services when Gillard and/or Rudd governments were led to restrict visas under the guise of caring for the environment ie. ‘sustainable population’ (rebranding of the old fossil fuel oilgarchs’ eugenics movement). Of late, one cannot help but notice how any union voice or commentary, good or bad, has been disappeared by mainstream media? Such old class politics played on behalf of elites, playing off native versus immigrants, and some unions and/or Labor have been partly responsible by being led into this cul de sac in past decade or two. We cannot hope to defeat an extremist right while we fail to deal with those, who claim to be progressive, working against the left from within. This was always the agenda of wealthy corporations, the Liberals and Murdoch Press to manufacture a picture of and alienate the people from the union, divide, conquer and destroy. The extension of that old bulldog colonialism which the Liberals have pulled off so well. The only victim here is the people, and now that we are onto it, they take the Dutton route of national security because they have lost the cause, their deception to fool the people has been exposed. So the next battle will be to demonise and criminalise the voice of critical reflection, freedom and dissent. The next battle will be in the courts and streets. The employers, helped by the Libs/Nats are clearly winning this war, helped along by unions like the Shoppies doing deals against members interests. Victoria your article should be required reading for every worker in an industry where a union exists or is active. Sadly non-unionists also benefit from improved wages and conditions so have no incentive to pay the fees. This was always a frustration for me when I was active in my union (AJA/MEAA) where a lot of people believed their wages/conditions were all their own work. Be that as it may, there will be no change until we demolish the LNP decisively and for a long time. I’ll play devils advocate here and ask, what happens if the LNP and employers groups completely achieve what they desire and a large percentage of the population are impoverished. What happens then? They’ll be like a dog that chases cars – once caught – no effing idea what to do with it. Social decline will ensure that they spend ever increasing amounts of time in fear and looking over their shoulders besieged by people willing to do anything to take what they’ve got, which is a most curious role reversal given how they achieved it. Then will they wake up and realise that they OWN a country overwhelmed in inequality that’s basically an urban war zone? Watched journos at play this a.m. out of the corner of my eye i.e. ABC’s Insiders; where they all look like each other, agree with each other and/or don’t go off piste. I am all for gender equality but it seems if you are female and want a mainstream journalism media role you must toe the line and be quite conservative; even the women at The Guardian sound more comfortable talking the game, tactics and outcomes but avoid any contentious content (might scare the oldies? ); hence nowadays centre right is left? Again…. Laura Tingle had to drop her dog whistle in, claiming high levels of immigration which she put at at 300k, infrastructure not keeping up…. This is the ‘nebulous’ NOM which includes Australians and is about ‘border movements’ not ‘immigration’ which are largely estimated anyway leading to an ‘estimated resident population’. But provides scary headlines for the xenophobes masquerading as ‘liberal and environmental’ to get people talking….. who got to her? It’s become a regular feature of her commentary on RN’s LNL and AFR….. If the UK and especially the USA are anything to go by we have a long way to go before your fears are realised. A great read VR and you didn’t mention fourhundredandfiftyseven. Ads cannot have doug cameron et al involved in the campaign. ps does 457 jobs count in the ‘new’?? Great article Victoria but also depressing as it highlights how little power workers now have, at least in part due to their lack of political awareness. 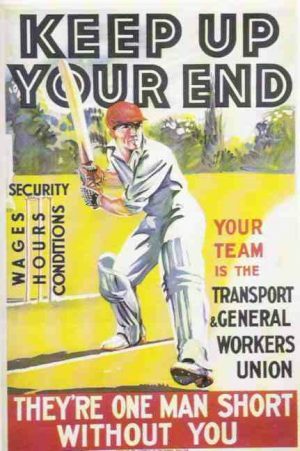 Privatisations, outsourcing, tariff reductions, and globalisation have all contributed to the decline in union membership. A raft of anti-union laws have further swung the industrial balance of power decisively in favour of employers. And unsurprisingly most employers have taken advantage of their impotent and docile workforce. The abandonment of the post-war commitment to full employment is another key factor: unemployment and underemployment is substantial and the threat of joining the ranks of the unemployed is also there when employers have the whip hand. A future Labor government should commit to restoring full employment. As a start and only a start, I believe the best way to do this is to introduce a Job Guarantee, ie an unconditional offer of a job for anyone who wants work but cannot get it, payable at least a living wage . The Job Guarantee is a federal program that provides sufficient funding to local communities (either through existing councils, through specially designed set of departments and organisations, or through non-profit and social entrepreneurship sectors), to employ at a socially inclusive minimum wage anyone who is willing to work but unable to find work in the private sector.